Unloading lobster pots at end of season in Menemsha. Sand mining, the need for community support and a permitting system that some Island fishermen say is flawed and broken were key topics at a recent meeting of the Martha’s Vineyard Fishermen’s Preservation Trust. Fifteen people, many of them young fishermen, sat in a circle of white benches in the Agricultural Hall in West Tisbury last Tuesday and spoke freely about the state of the Island’s fisheries and the challenges the trust will face going forward. It was the trust’s second public meeting since regrouping in October. Following its involvement in a lawsuit against the developers of Cape Wind which ended in a settlement in 2012, the trust, which grew out of the former Martha’s Vineyard - Dukes County Fishermen’s Association, went into a period of dormancy. It emerged this year with a renewed mission to support the Island’s commercial fishing community. The centerpiece of the trust is a permit bank that will aim to give young fishermen a foothold in the industry and help the more established fishermen diversify their catches. Catching and selling fish and shellfish requires state and sometimes federal permitting, depending on the area. The trust hopes to raise enough money through donations or other means to buy federal permits — which can cost tens of thousands in areas closed to permitting — and lease them to local fishermen at an affordable rate. But the details of the program are still vague. Questions on Tuesday included how many permits to buy, which types of fishing should be covered, how the leasing program should operate, and how to ensure that the permits will stay in the community. Warren Doty, a Chilmark selectman who played a key role in the Cape Wind lawsuit and settlement, and is now a member of the trust’s board of directors, agreed. “It’s absolutely broken,” he said. Mr. Doty cited the Cape Cod Commercial Fishermen’s Alliance, based in Chatham, as a model for how the Island permit bank might operate. 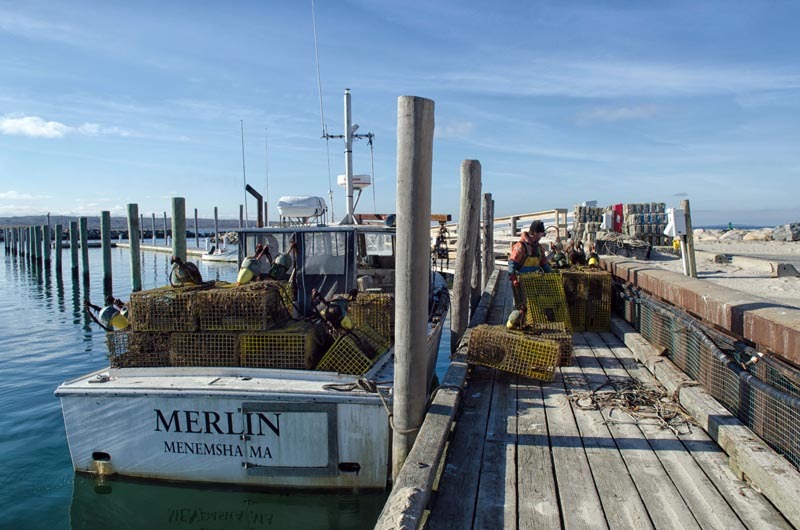 One part of the alliance, the Cape Cod Fisheries Trust, offers quota leasing, loan programs and other services to support commercial fishermen. Members of the Cape Cod alliance share the benefits of federal permits for scallops, surf clams and groundfish. But state permits are associated with specific boats, and the trust does not want to acquire hard assets. So it plans to focus on the federal permits, and possibly provide financial support for the state permits. Stephen Larsen, a lobsterman from Chilmark, said that around the Vineyard, sea scalloping is dominated by large boats from New Bedford. “There isn’t that much scalloping activity that’s going on out here,” he said. He also worried about the financial challenges faced by young people entering the industry. “There is not a lot of money in the business after tax time for the fishermen anyhow,” he said. “It’s kind of more of a lifestyle.” He added that as older fishermen retire, there might not be a new generation waiting to take over, and highlighted the need to keep permits on the Island. The group was joined by David White, executive director of The Yard, an artist residency in Chilmark, who offered guidance based on his nonprofit experience. He emphasized the need to reestablish a balance between corporate and small-scale fishing by developing new policies. But the nearer-term goal is to raise enough money to get the permit bank off the ground. Mr. White pointed to the two per cent transfer fee on real estate that supports the Martha’s Vineyard Land Bank and suggested a similar but smaller fee to support commercial fishing. He also drew a connection between commercial fishing and affordable housing. “What we need here is a subsidized fishing effort that moves forward several generations,” he said. The Nature Conservancy is one possible funding source, said Island trust director John Keene, who owns an excavation company in West Tisbury. The Cape Cod alliance is working to help secure 501c3 status for the trust, and is also offering legal advice. Mr. Keene said a grant from the Walton Family Foundation — started by the founders of Wal-Mart — requires the alliance to spend 50 per cent of the funding to support other groups. Oyster farmer Jeremy Scheffer suggested seeking the support of Rep. Tim Madden and Sen. Dan Wolf, who he said are usually receptive to local concerns. Some believed that the recent controversy surrounding sand mining in the waters around the Vineyard might be a rallying point for community support. Everyone in attendance on Tuesday opposed the idea of sand mining near the Vineyard, which is proposed as part of the state’s Ocean Management Plan and has stirred debate among Island towns this year. The proposed sand mining areas include major breeding grounds of sea conchs and other species. In regard to sand mining, and also restrictions on conch fishing which were discussed at the meeting, some believed the trust could influence state decision making through petitions.